It’s the show everyone seems to be talking about, and the most-watched, as it had the biggest BBC drama overnight viewing figures since the Doctor Who Christmas episode of 2008. The big question is – is it worth the hype? The answer to that question is simply yes. This review will be relatively spoiler free, so don’t worry about seeing any in this post. If, however, you decide not to read on for fear of spoilers, take one thing away: go and watch this show. Bodyguard follows the story of David Budd, who is assigned to protect the Home Secretary, played by Keeley Hawes. The story is set in London in a time when the terrorist threat to the UK is very high. The plot unfurls across six episodes, and maintains high tension and mystery throughout. Tension and suspense drives the thrill of this series, and boy does it have bucketfuls of suspense. There are lots of twists and turns with conspiracies, and I found it totally unpredictable in the most exciting way. I liked that it wasn’t too violent. So many TV shows these days have unnecessary violence. There was one scene where rather a lot of blood got splattered about, and David Budd does seem to regularly walk about with injuries and blood on his face. But the suspense is built from tense scenes, rather than violence, which I really liked. Nothing felt rushed. The slow build of scenes meant that suspense took the forefront in this series. I’ve talked a lot about the suspense, but another thing that makes the show great is the characters. The main character, David Budd, is an Afghanistan war veteran suffering from PTSD now working as a protection officer. Richard Madden did a great job at portraying his character, and aside from the main conflicts, another part of the story was seeing David’s developing relationship with his wife (whom he is separated from) and children. It’s great to see the number of female characters in important positions. Not only is there the Home Secretary, but there are three key female characters within the police force, including the Head of the Metropolitan Police Counter Terrorism Command. I haven’t quite given Bodyguard five stars, instead leaning to a 4.5 rating. Why? When I have heaped praise upon it? There was one scene in the last episode that seemed a little unrealistic to me. There were a couple of others things that were maybe little plot holes. But other than that, I can find little criticism for this show. It was unpredictable, thrilling and totally worth watching. Although the main plot was resolved, there were a couple of loose ends that weren’t tied off, potentially leaving it open for another series. As it has proven so popular, I wouldn’t be surprised if we haven’t seen the last of Bodyguard. The vampire novel that started it all, Bram Stoker’s Dracula probes deeply into human identity, sanity, and the dark corners of Victorian sexuality and desire. When Jonathan Harker visits Transylvania to help Count Dracula purchase a London house, he makes horrifying discoveries about his client. Soon afterward, disturbing incidents unfold in England—an unmanned ship is wrecked at Whitby, strange puncture marks appear on a young woman’s neck, and a lunatic asylum inmate raves about the imminent arrival of his “Master”—culminating in a battle of wits between the sinister Count and a determined group of adversaries. Dracula is a long book, and although my interest in it waned and revived at various points, my overall feeling after finishing it was that I had on the whole enjoyed it. Many a classic has told a lacklustre tale of Victorian families, but throw vampires into the mix and you get an altogether more captivating read. I have the Penguin Classics hardback clothbound edition, which is of lovely quality, with thick and smooth pages. The novel is written in an epistolary form, using a mixture of diary entries, letters, telegrams and newspaper articles, told from a variety of viewpoints. This is something which not every reader will like. The book is constantly switching between narrators and between the different written pieces (letters, diaries etc. ), something which I had expected to dislike. However, because it moved around a lot between different characters, and so different stories (until the various threads become intertwined later in the book), I think that prevented me from becoming bored with it. Often when narrators switch too often it feels disjointed, but this format works for this book, as the patchwork of letters and journal entries is itself an element of the plot. All was going well, until the latter half of the book when the male characters began to emphasise ridiculously one of the female characters ‘femaleness’ and how they didn’t want her to witness the terrible, vampire-y things going on. This went on quite persistently in ridiculous volume for a couple of chapters. Now, obviously women were viewed by society in a particular way in the Victorian period, so this isn’t exactly surprising. It was how much it was emphasised through the repetitiveness with which the male characters discussed her sensitive disposition as a woman and other such phrases. It became very irritating and made me frustrated at the book, which up to that point I had been mildly enjoying. At least she proved herself to be intelligent and resourceful, despite their attitudes towards her. The concluding section of the book when the chase of Dracula commences was exciting and kept my attention, making me want to read to the end to discover the fates of the characters. So despite some moments that dragged and my attention wavered, and the section where the woman was treated as weak, the rest of it was actually pretty good. My conclusion upon closing the cover was that I was glad to have read it. Vampires are such a prolific part of our culture, and there have been so many varied adaptations and interpretations of Dracula, that it was interesting to read the original story. FINALIST, Young Adult Finalist in the IAN Book Awards, 2015. 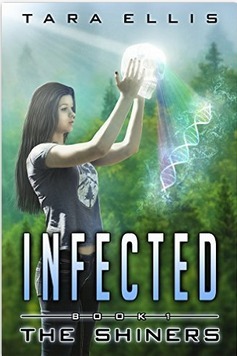 Infected, The Shiners is book one in the Forgotten Origins Trilogy. I read this as part of a book club. Although I wasn’t sure about it at the beginning, it got much better as it went on. The start has far too much info dumping about Alex’s past which took me out of the present story and made me lose interest. I got pretty bored of all the recap about her life. If it hadn’t been for the book club, that really would have put me off and I might not have carried on reading. Fortunately, I did carry on and things picked up. The first half was quite slow but I was intrigued, especially when it started getting creepy. The latter half of the book is much faster and I finished it quite quickly once I got to that point as the pace was full on. Although I like that it got really intense and fast paced, I think the first half could have been paced better so there wasn’t such a dramatic shift. There’s not much I can say about the plot without giving away spoilers! It reminded me of a strange mix of The Host, National Treasure and Indiana Jones. I liked the mystery and adventure element – I do love a good hidden clue. There isn’t really an explanation for the infection and how or why it came to Earth in a meteor shower, but I’m guessing that’s something that will be dealt with more in the next books in the series. The middle section was particularly creepy once people started changing as a result of the infection, and the author did this suspenseful aspect really well. I liked Alex’s character and the relationship with her brother was shown really well. Their faithful dog companion was also adorable. I thought Chris’s character was great, and I liked that the author didn’t ignore religion. Most YA literature I’ve read, especially science fiction, just seems to ignore religion, but Chris is religious. It just made a nice change for it to be featured in a story, not for any particular plot reason, but just as part of the characterisation. The first few chapters were more like a 2 star, but it picked up, especially in the second half (which I would have given a 4 star), and I found myself really gripped. The quality of the writing also improved. Overall I enjoyed it but the pacing of the book and the opening few chapters were weak in comparison to other aspects of the book.